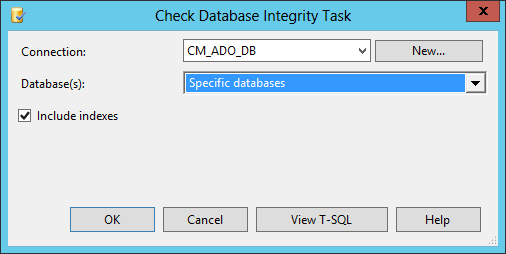 The SSIS Check Database Integrity Task allows you to verify the consistency of your databases. 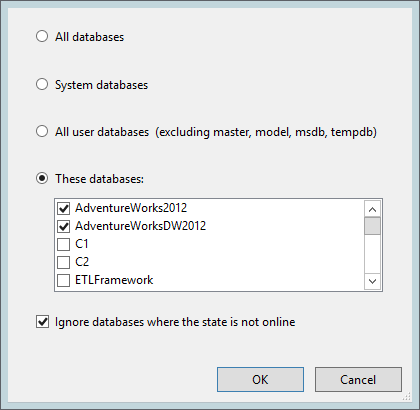 In this example, I'll check two specific database: AdventureWorksDW2012 and AdventureWorks2012. Via the DatabaseSelectionMode, you can specify whether it should check All, System, User or Specific databases. 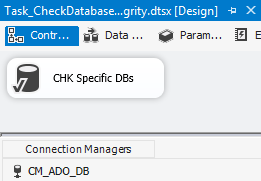 The Biml for Check Database Integrity task requires an ADO connection manager. The Control Flow will have a single Task in it along with our ADO.NET Connection Manager. The Task itself allows you to select a connection manager and the database selection mode. The details screen allows for the selection of specific databases as well as behaviour for offline mode.